If you’ve caught yourself daydreaming about escaping the scorching heat and heading to the mountains for a snowy adventure, then you’ve probably started searching for ski equipment already. While the experienced skier or snowboarder will have an easy time replacing their gear, most newbies won’t even know where to start looking. If you’re reading this article, you’re probably a rookie, but don’t worry I’m here to help you out. The online market is arguably the best place to look for new equipment, as you can definitely find more affordable pieces, and you’ve got more choices to go through without actually leaving your couch. If you’re into skiing, then obviously you need a pair of skis. You can buy ski gear online relatively easy, as long as you know what to look for. There are many different types and brands, and different types are meant for different terrain. More often than not, the website you shop from will have customer support – knowledgeable representatives, who will direct you towards a decent pair of universal-type skis that will be appropriate for most slopes. Furthermore, you’re going to need a pair of poles. Unlike skis, you don’t need to spend a ton of money on poles. In fact, when you set out to buy ski gear online, buy the cheapest poles you can find. They’ll probably be good enough to get you through your beginning stages. Pay attention to their length, and make sure to refer to a sizing chart before you make your purchase. Composite and aluminium poles are slightly heavier than other types, but they’re incredibly durable, which is really important when you’re starting out and learning how to stay upright. Then, you need to pick decent bindings. In case you didn’t know, bindings are the parts that connect your boots to the skis. The right width of bindings will depend on the width of your skis. It’s generally recommended that you get someone experienced to mount the bindings to the skis so that they can also help you with setting your DIN. 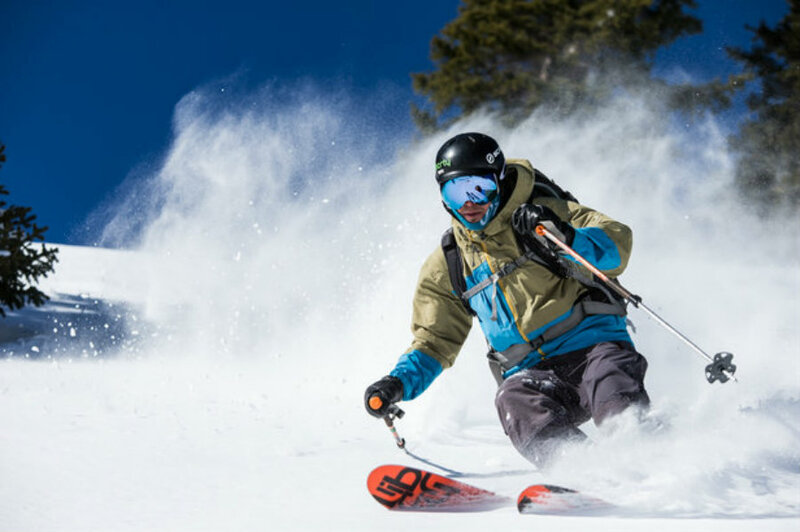 The DIN is the release force setting which determines how sensitive the skis are to detaching under pressure. The right DIN setting depends on your skill level, height, and weight. Lastly, you need boots. Ski boots can be uncomfortable at first, but eventually, they’ll settle on your feet nicely. Finding a pair that’s comfortable and fits you right is of paramount importance, as they can greatly influence how you perform on the slopes. You can also rent boots, and ask for assistance for a proper fit there. Once you get the right pair from the rental service, you’ll have a good idea of what to look for when shopping for a pair for yourself.